Storyline 3 lets you shuffle (randomize) answer choices for many question types. You can even shuffle some answer choices while others remain stationary on the same question slide. In Form View, go to the Question tab on the ribbon and use the Shuffle drop-down to select Answers or None. In Slide View, go to the Question Tools—Design tab on the ribbon and use the Shuffle drop-down to select Answers or None. In Form View, go to the Question tab on the ribbon and select Answers from the Shuffle drop-down. This turns on shuffling for the question. Then, right-click each answer choice that you don't want to shuffle and select Anchor Choice. This locks the answer choice in its current position; it won't get shuffled with the other answer choices. Each answer choice that's anchored in place will display a chain link icon. 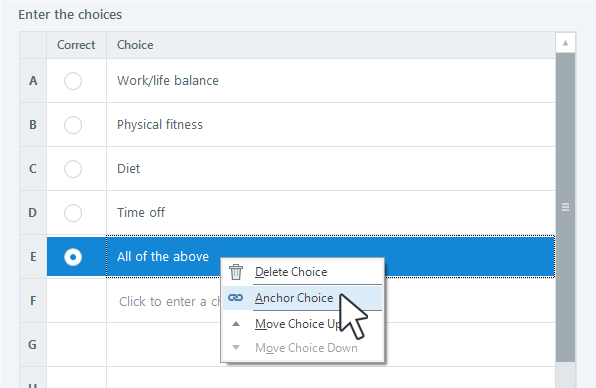 If you change your mind, right-click the answer choice again and select Remove Anchor.